When A.M. Naik started out, his odds of getting a job at L&T were low. But the company's success owes much to his doggedness. Anil Manibhai Naik, Chairman of Larsen & Toubro since 2003 , loves to talk about how he beat IITians when he was starting out. In 1963, as a fresh engineering graduate of Birla Vishwakarma Mahavidyalaya, Gujarat, the odds of him scoring even an interview at L&T were zero, because the company hired only alumni of the Indian Institutes of Technology. However, after a stint at Nestler Boilers, Naik did land a job at L&T in 1965. And by April 1966, he was ahead of IITians who graduated when he did. Naik joined L&T as Junior Engineer on March 15, 1965. As it turned out, the timing was fortuitous: it made him eligible for a promotion at the time of his confirmation in September of that year. He got a second promotion in April 1966. Thanks to a union agreement, he got an increment of Rs 75, bringing his salary up to Rs 1,025 a month. In 1963, he had told a friend: "One day, I will earn a four-figure salary." He never thought it would be so soon. Naik is a workaholic with a strong sense of personal achievement. For the first 21 years of his career, he says, he never took leave - not even a weekly day off. "We had Saturdays off, and I would usually come in from a tour on a Saturday, and then go around the plant on Sunday," he says. So even before he became CEO, Naik had started preparing to lead L&T. By 1999, the 57-year-old Naik was the most senior man in the company, and the automatic choice for CEO and Managing Director. Almost a decade before Naik became CEO, he had seen an attempt by Dhirubhai Ambani's Reliance Industries to take over L&T. Later, he served on the L&T board alongside Mukesh and Anil Ambani. Naik had met Aditya Birla and his son Kumar, when the Birlas tried - unsuccessfully - to hire him. In 2001, when the Ambanis sold their stake to the Birlas, Kumar Mangalam Birla said to Naik: "You did not come to us, but we are coming to you." Birla wanted the cement business to be hived off from L&T, and eventually take control of L&T. But differences arose between the L&T management and Birlas on how to go about it. Grasim Industries, the company through which the Birlas held their stake, filed a prospectus for an open offer for L&T shares. The battle and deal-making that followed saw the cement unit finally being hived off, and Naik elevated to the position of Chairman and CEO of L&T. Naik says the cement unit demerger that followed helped the company, rather than hurting it. "For L&T it was a blessing. No disguise, just a blessing." In 2005, the company formed the L&T Employees Foundation, which bought L&T shares from Grasim for Rs 766.50 crore. The foundation created a block of about 17 per cent of L&T stock, including shares held under the employee stock ownership plan, or ESOP. The foundation's constitution does not allow it to sell the shares. So, as long as the company has the support of Indian financial institutions, it will always be controlled by the management. Naik created L&T's own version of the 'poison pill' to safeguard the company from predators. Rajiv B. Lall, Managing Director and CEO of Infrastructure Development Finance Company, says of Naik's leadership: "I think L&T is an extraordinary story of a professionally run organisation that has developed for itself a leading position in many fields related to construction and engineering. It has taken full advantage of how the whole capex story underpins growth in the country. Naik is a force to reckon with." Y.M. Deosthalee, former Chief Financial Officer of L&T, who is now Chairman of L&T Finance, says the foundation was Naik's idea. "His business acumen is really high," he says. He has been with Naik on the L&T board for over a decade, and has known him for more than two. He says Naik's greatest strengths are his long-term vision and networking chops. "He works very hard, and expects the same from others. He does not accept mediocre work," says Deosthalee. What does Naik consider his biggest move at L&T? He goes back to the 1970s, when an Indian management took over L&T and promotions became driven by seniority instead of merit. On the fast track until 1974, he now found himself among the slowest movers: it took him 12 years to rise from deputy general manager to general manager. His sluggish progress prompted other companies to offer him jobs. "A very unfortunate degeneration of merit began," he says. He sought to make merit an important part of his blueprint for L&T's success. In the past 10 years, the company has changed its remuneration structure four times to achieve this goal. It has tried to be in tune with a restless and ambitious generation that believes one cannot get to the top without changing jobs. Naik explains that in a seniority-driven atmosphere, people are compared to others of their age and with their experience, and it is difficult for an efficient worker to break through the ranks. Things have changed, he adds. "An L&T man is sought after by other companies, especially multinational companies coming to India." Asked whether he ever thought of quitting L&T, especially during the tough days in the 1970s and 1980s, Naik says he has applied for a job only twice, and never after joining L&T. "Just four months after I became CEO in 1999, I got a call from a head-hunter seeking an Asia head for a multinational company," says Naik. He said he was not interested, and asked the head-hunter if he was interested in helping L&T hire people. "That was the last call I got," he says. "People realised it is impossible to dissociate Naik from L&T." If anything defines him more than his sense of achievement and his 18-hour workdays, it is loyalty to the company. Like his father, an educator who returned to his village from Mumbai after retirement, Naik plans to devote himself to education. However, he does not plan to leave the city. His retirement home is across from L&T's campus in Powai. He has often said he wants to die with the factory in sight. 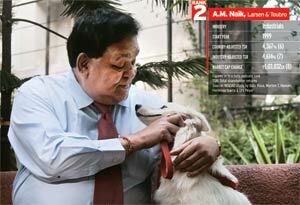 Naik's love for L&T began even before the company hired him. He had to choose between an interview in Pune with electronics manufacturer Philips and one with L&T in Mumbai, as both were on the same day. In the second round of interviews, he was deemed "over-confident". L&T reduced its offer by Rs 90 to Rs 670 a month, and offered a lower designation. His employer at the time, Nestler Boilers, was planning to send him to England for training, and had promised a salary of Rs 850 a month after he returned. In spite of everything, Naik chose L&T. What happened then, we know.